Generates a discrete, ramped data with options for number of steps, data direction, min and max data, CC number and glider between data points. The idea is that something (a parameter) is mapped to the change in a drum hit or a repetitive note - i.e. 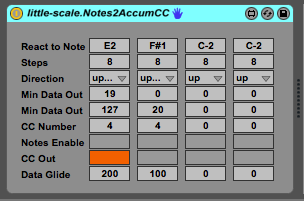 just one MIDI pitch which is isolated, and then this is accumulated in a counter which is then scaled and converted to MIDI CC data. Useful for visual and effects mapping.